PHOTO PROVIDED Co-Artistic Directors Juliana Athayde and Erik Behr of Society for Chamber Music in Rochester continue their compelling programming with “Mozart in France” on Sunday, December 16. 4 p.m. | Pre-concert talk at 3:30 p.m. The Society for Chamber Music in Rochester is known for putting together captivating programs. For next weekend's concert, which takes place on Sunday, December 16 at the Performance Hall at Hochstein, SCMR does it again, with a program called "Mozart in France." 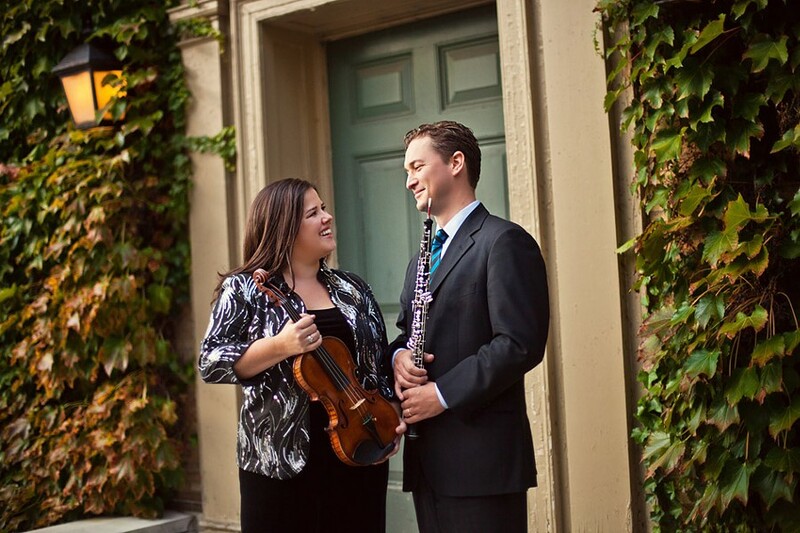 Devised by Artistic Directors Juliana Athayde and Erik Behr, who are also the Rochester Philharmonic Orchestra's Concertmaster and Principal Oboe, respectively, it brings together what they describe as "four vastly different works." But as Behr explains, these four works hang together very engagingly. "We like to start with a specific piece that captures our interest," Behr says, "and then try to find other works that feature combinations based on the instrumentation of the capstone work and, hopefully, that also have some programming link to that work." The Mozart work on this program is his Triofor Piano, Clarinet and Viola, K. 498, nicknamed "Kegelstatt." Its link with France is tenuous. Mozart did indeed spend most of 1778 in Paris, but unlike most Parisian visitors, he had a miserable time. He wrote this work in Vienna much later, but the manuscript is housed in France, in the collection of the Bibilothèque National. Whatever its provenance, this is a delightful, mellow trio for three of Mozart's favorite instruments. "Kegelstatt" more or less means "bowling alley" - referring to a favorite pastime of Mozart's when he wasn't writing masterpieces. The rest of the program is firmly, but unconventionally, French. Athayde and Behr have chosen works by three French composers from the 19th century, early-20th century, and 21st century: Camille Saint-Saëns, Lili Boulanger, and Guillaume Connesson. Only the first of the trio could be considered a household name. The long-lived Saint-Saëns was born in 1835, when Mendelssohn, Schumann, and Berlioz were up-and-coming composers. The Frenchman died in the age of Stravinsky, Debussy, and Schoenberg - and Saint-Saëns hated them all. By the time he wrote his Oboe Sonata in 1920, this prodigiously gifted and imaginative composer was almost as much of a fossil as the ones he depicted in his "Carnival of the Animals." Be that as it may, Erik Behr, who will perform the sonata on this concert, finds Saint-Saëns "a fascinating character." "His peculiar interests come through in his music in intriguing ways," Behr says. "Listen for the Renaissance harmonies he injects into the oboe sonata. It was rare for a composer of his time to have studied and incorporated music from this period." Lili Boulanger, who died in 1918 aged only 24, was for many years known mainly as the sister of the renowned musical pedagogue Nadia Boulanger, teacher of such American composers as Aaron Copland, Roy Harris, David Diamond, and Philip Glass. But Lili wrote strikingly dramatic music, particularly large-scale choral works. Among her earliest pieces are "Nocturne" and "Cortège," paired as a single work for violin and piano. More salon-like than her larger works, it is nonetheless the work of an important talent. Boulanger's appearance on this program underlines SCMR's mission to represent female composers, "but in a thoughtful way that makes their works feel organic and not forced," Behr explains. "This concert seemed to be a great place for one of Lili Boulanger's works." Guillaume Connesson, born in 1970 and considered one of France's leading contemporary composers, is represented by a Sextet for Oboe, Clarinet, Violin, Viola, Double Bass and Piano, written in 1998. Listeners who either think that French music stopped with Ravel or avoid contemporary music on principle will have a pleasant surprise in store. Connesson's 15-minute work offers catchy tunes, crisp and colorful instrumental writing, and infectious rhythmic verve - musical qualities that many consider "French." One of Connesson's illustrious French predecessors, Francis Poulenc, wrote a popular sextet for winds and piano in the 1930's, and Connesson's sextet does suggest a felicitous, hypothetical collaboration between Poulenc and American Minimalist Steve Reich. Behr recalls that he and Athayde were introduced to Connesson's music by RPO guest conductor Fabien Gabel. "The sextet is a work Juliana and I loved at first hearing and we desperately wanted to program it, so we based the rest of this concert around it," Behr says. "Connesson marries together so many enjoyable current trends in music with unique instrumentation. We think the audience will be just as thrilled with this piece as we are." Co-Artistic Directors Juliana Athayde and Erik Behr of Society for Chamber Music in Rochester continue their compelling programming with "Mozart in France" on Sunday, December 16.